Shipped with 24 hrs direct from USA warehouse. Fill your own Tea Bags! Tea Cup Size Bags! 500 ct These classic "press and seal" empty tea bags are indispensable for all your custom tea blends. A fun and economical way to share any herbal formulas you create. These bags are used for filling with 3 - 8g mixture of tea or dry herb or plants. All our bags are heat sealable and oxyden bleached! How to fill a Tea Bag: 1) Fill about half full with tea or herbs 2) To seal, press with a household iron on cotton setting or use a curling iron. 3) Enjoy a fresh cup of tea! Approx. size of tea bag 2.25" x 2.375" (62 x 55 mm) About the tea paper: Our tea filter paper is the same tea paper that is used by the largest tea companies in the United States. In fact there are really only two major suppliers of tea filter paper in the world. The tea paper is made of a special blend of thermoplastic fibers, abaca, and cellulosic fibers. This tissue has a high wet strength with neutral odor and flavor characteristics making it a highly acceptable media for bagging tea. The tea paper is compost-able but not biodegradable. Shipped with 24 hrs direct from USA warehouse. Fill your own Tea Bags! Tea Cup Size Bags! 100 ct These classic "press and seal" empty tea bags are indispensable for all your custom tea blends. A fun and economical way to share any herbal formulas you create. One tea bag holds approximately 1-4 ounces of herbs. All our bags are heat sealable and oxygen bleached! How to fill a Tea Bag: 1) Fill about half full with tea or herbs 2) To seal, press with a household iron on cotton setting or use a curling iron. 3) Enjoy a fresh cup of tea! Approx. size of tea bag 2.5" x 2.75" (62 x 55 mm) About the tea paper: Our tea filter paper is the same tea paper that is used by the largest tea companies in the United States. In fact there are really only two major suppliers of tea filter paper in the world. The tea paper is made of a special blend ofthermoplastic fibers, abaca, and cellulosic fibers. This tissue has a high wet strength with neutral odor and flavor characteristics making it a highly acceptable media for bagging tea. The tea paper is compost-able but not biodegradable. The double walls create a highly effective layer of insulation that keeps hot drinks hot without burning your fingers and cold drinks cold without messy condensation. What's your flavor? This tea bag will allow you to mix your tea, creating your own endogenous. You can enjoy your unique mix time after time without polluting Mother Earth~ tolerance from -50°C to 230°C. Shipped with 24 hrs direct from USA warehouse. Fill your own Tea Bags! Tea Cup Size Bags! 100 ct These classic "press and seal" empty tea bags are indispensable for all your custom tea blends. A fun and economical way to share any herbal formulas you create. These bags are used for filling with 3 - 8g mixture of tea or dry herb or plants. All our bags are heat sealable and oxygen bleached! How to fill a Tea Bag: 1) Fill about half full with tea or herbs 2) To seal, press with a household iron on cotton setting or use a curling iron. 3) Enjoy a fresh cup of tea! Approx. size of tea bag 2.25" x 2.375" (62 x 55 mm) About the tea paper: Our tea filter paper is the same tea paper that is used by the largest tea companies in the United States. In fact there are really only two major suppliers of tea filter paper in the world. The tea paper is made of a special blend of thermoplastic fibers, abaca, and cellulosic fibers. This tissue has a high wet strength with neutral odor and flavor characteristics making it a highly acceptable media for bagging tea. The tea paper is compost-able but not biodegradable. Shipped with 24 hrs direct from USA warehouse. Fill your own Tea Bags! Tea Cup Size Bags! 200 ct These classic "press and seal" empty tea bags are indispensable for all your custom tea blends. A fun and economical way to share any herbal formulas you create. These bags are used for filling with 3 - 8g mixture of tea or dry herb or plants. All our bags are heat sealable and oxygen bleached! How to fill a Tea Bag: 1) Fill about half full with tea or herbs 2) To seal, press with a household iron on cotton setting or use a curling iron. 3) Enjoy a fresh cup of tea! Approx. size of tea bag 2.25" x 2.375" (62 x 55 mm) About the tea paper: Our tea filter paper is the same tea paper that is used by the largest tea companies in the United States. In fact there are really only two major suppliers of tea filter paper in the world. The tea paper is made of a special blend of thermoplastic fibers, abaca, and cellulosic fibers. This tissue has a high wet strength with neutral odor and flavor characteristics making it a highly acceptable media for bagging tea. The tea paper is compost-able but not biodegradable. Shipped with 24 hrs direct from USA warehouse. Fill your own Tea Bags! Tea Cup Size Bags! 50 ct These classic "press and seal" empty tea bags are indispensable for all your custom tea blends. A fun and economical way to share any herbal formulas you create. These bags are used for filling with 3 - 8g mixture of tea or dry herb or plants. All our bags are heat sealable and oxygen bleached! How to fill a Tea Bag: 1) Fill about half full with tea or herbs 2) To seal, press with a household iron on cotton setting or use a curling iron. 3) Enjoy a fresh cup of tea! Approx. size of tea bag 2.25" x 2.375" (62 x 55 mm) About the tea paper: Our tea filter paper is the same tea paper that is used by the largest tea companies in the United States. In fact there are really only two major suppliers of tea filter paper in the world. The tea paper is made of a special blend of thermoplastic fibers, abaca, and cellulosic fibers. This tissue has a high wet strength with neutral odor and flavor characteristics making it a highly acceptable media for bagging tea. The tea paper is compost-able but not biodegradable. Shipped with 24 hrs direct from USA warehouse. Fill your own Tea Bags! Tea Cup Size Bags! 500 ct These classic "press and seal" empty tea bags are indispensable for all your custom tea blends. A fun and economical way to share any herbal formulas you create. One tea bag holds approximately 1-4 grams of herbs. All our bags are heat sealable and oxygen bleached! How to fill a Tea Bag: 1) Fill about half full with tea or herbs 2) To seal, press with a household iron on cotton setting or use a curling iron. 3) Enjoy a fresh cup of tea! 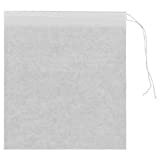 Size of tea bag 2.5 x 2.75 inches (62 mm x 70 mm) About the tea paper: Our tea filter paper is the same tea paper that is used by the largest tea companies in the United States. In fact there are really only two major suppliers of tea filter paper in the world. The tea paper is made of a special blend ofthermoplastic fibers, abaca, and cellulosic fibers. This tissue has a high wet strength with neutral odor and flavor characteristics making it a highly acceptable media for bagging tea. The tea paper is compost-able but not biodegradable. Shipped with 24 hrs direct from USA warehouse. Fill your own Tea Bags! Tea Cup Size Bags! 200 ct These classic "press and seal" empty tea bags are indispensable for all your custom tea blends. A fun and economical way to share any herbal formulas you create. One tea bag holds approximately 1-4 ounces of herbs. All our bags are heat sealable and oxygen bleached! How to fill a Tea Bag: 1) Fill about half full with tea or herbs 2) To seal, press with a household iron on cotton setting or use a curling iron. 3) Enjoy a fresh cup of tea! Size of tea bag 2.5 x 2.75 inches (62 mm x 70 mm) About the tea paper: Our tea filter paper is the same tea paper that is used by the largest tea companies in the United States. In fact there are really only two major suppliers of tea filter paper in the world. The tea paper is made of a special blend ofthermoplastic fibers, abaca, and cellulosic fibers. This tissue has a high wet strength with neutral odor and flavor characteristics making it a highly acceptable media for bagging tea. The tea paper is compost-able but not biodegradable. Another natural, quality product brought to you by Rina's Garden Creations. 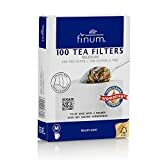 Finum Tea Filter size medium Up to 6 tea cups finum filters are internationally renown. The medley of sizes give each tea enthusiast the chance to enjoy their tea in their individually preferred manner. Our oxygen bleached paper is famous for its unique true-flavor filtering qualities. They are chlorine free and biodegradable. To be used with a filter holder (click, clip, top holder or the filter stick).